Uglyworld #1784 - Rubix Cube Solverings Roboter - (Project TW - Image 360-366), a photo by www.bazpics.com on Flickr. Santa leavereds me a littlers noter that he was unable to fulfills the final item on my xmas wishlister which was "happy facers for Tray", he tellereds me in his noter that only I can makers that happens, oh ohs, I is in troublers if that is the casers! Santa wents on to say that he findereds me a substituters present insteads, a legos kitter, and not just any legos kitter, one withs a roboter brain! Baz and Mireille helpereds me to builds this craziers contraption behinds me, which they tellereds me would be ables to solver a rubix cube, like comes on, how can legos magicallies turn intos a rubix cube solverings roboter? I thinks someone has been drinkerings too many mulleds winers! 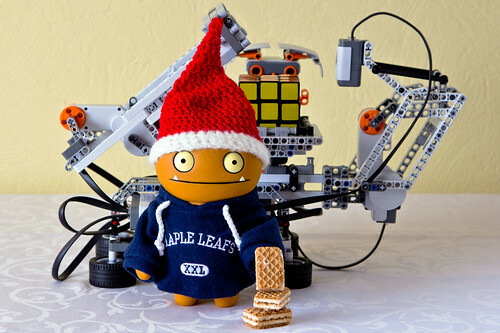 I decidereds to plays along with them for funs anyhows, and makereds sure that I hads some super tastier waffler cookies to munchers on while they tries to shows me that they has a super smarters roboter livings with us now!